PHILADELPHIA – Hillary Rodham Clinton overcame one of the greatest barriers in two and a-half centuries of American political history on Tuesday, when the Democratic National Convention formally selected her as the first woman presidential nominee of a major political party. Her shattering of the glass ceiling, which became foreordained two months ago, was something of an anticlimactic afterthought for many delegates still caught in the party’s latest bout with internal strife . But the momentous sense of occasion swept over the convention hall at 6:38 p.m. when the roll call of the states produced more than enough votes to guarantee her nomination. In the end, Clinton secured the nomination when South Dakota announced its votes, at which point Clinton had nearly twice the total of Bernie Sanders, Vermont&apos;s liberal populist senior senator and Clinton’s surprisingly dogged and passionate opponent all year. Despite her securing the nomination, the roll call continued through the alphabet, with Sanders&apos; Vermont delegation passing. In a painstakingly negotiated bit of stagecraft designed to project a return to party unity, Sanders appeared on the convention floor with the 26 delegates from Vermont as they announced the final delegate votes, bringing the count to 2842-1865. Then Sanders rose to speak, calling for suspending the rules and saying: "I move that Hillary Clinton be selected as the nominee of the Democratic party" by acclamation. Loud cheers on the convention floor drowned out plenty of scattered booing. Clinton&apos;s share of the delegates in the roll call was 60 percent. She won 55 percent of the delegates committed during the caucuses and primaries, but she was able to expand the margin of her triumph with the support of the vast majority of the 714 elected officials and other Democratic insiders known as super delegates. It was a system the Sanders camp complained bitterly about all year, and as a result the process will give less power to the party leaders in 2020. But, either way, Clinton won solidly if hardly resoundingly by every objective measure. Between January and June she was the choice of 16.6 million voters, or 55 percent of the total and 3.8 million more than Sanders, while capturing 34 of the nominating contests. Many delegates on the convention floor delighted in the historic moment. In all but about a dozen of the 57 states and territories, women helped to announce the vote totals that would lead to Clinton&apos;s nomination. "I never thought I would live to see this moment in time, the first African-American president about to be followed by the first woman president, said 73-year-old Rep. Frederica Wilson of Florida. "As a former school principal I just can&apos;t tell me what kind of a signal that is going to send to our nation&apos;s kids." After the roll call, her nomination was officially pronounced from the podium by Gov. Terry McAuliffe of Virginia, a former national party chairman and topflight Clinton family fixer and fundraiser for decades. "This is a day I can guarantee you will remember forever," McAuliffe said. He claimed the honor after Rep. Debbie Wasserman Schultz of Florida resigned the chairmanship and was effectively banished from the Wells Fargo center because a trove of leaked emails showed how the Democratic National Committee abandoned its publicly promised neutrality and considered various ways to tip the scales in Clinton’s favor. 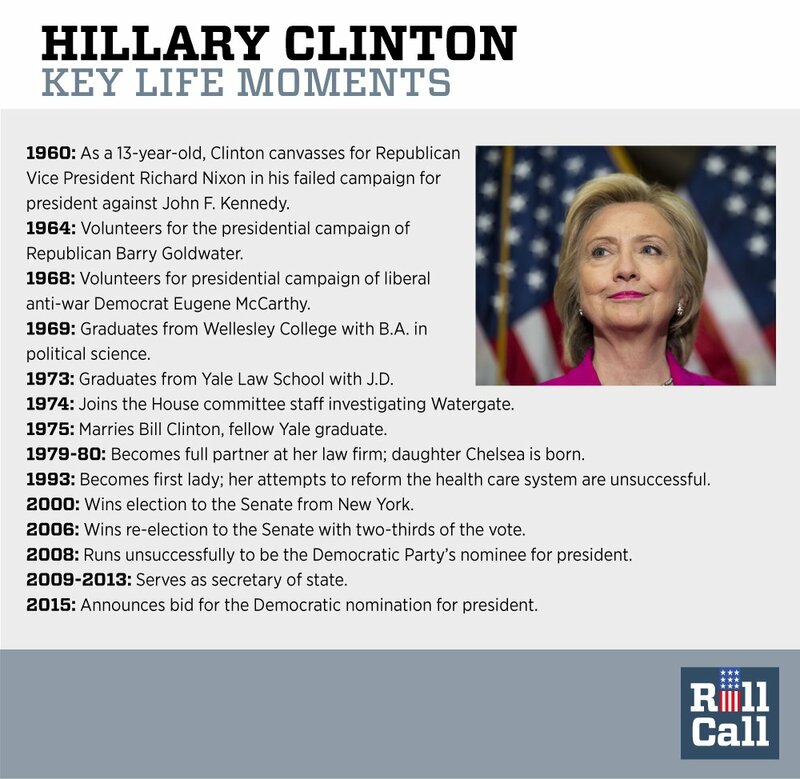 Clinton watched the moment from her home in Chappaqua, in the New York suburbs, purchased after she left the White House but before she became the only first lady to win an election by securing an open Senate seat 16 years ago. By that time, she had been deeply connected to both of her husband Bill’s winning presidential campaigns , and after a term a s a senator she first set her sights on claiming the Oval Office for herself, narrowly losing to Barack Obama in 2008 in one of the bigger upsets in modern presidential history. So only now, in her fourth contest for national office and after four years as secretary of state, has she secured such a big prize for herself – a triumph of tenacity and discipline that has so far proven greater than her record-high unfavorability ratings for a Democratic nominee and sustained skepticism about her ideological sincerity and personal trustworthiness. If she defeats Republican nominee Donald Trump , the billionaire real estate tycoon and reality TV star, her presidential term would culminate in 2020, the centennial of the ratification of the 19th amendment, which gave women nationwide the right to vote. This year’s election, though, comes 100 years after the first woman was elected to federal office: Montana Republican Jeannette Rankin, who won her only term in the House that year. Clinton was nominated by two members of Congress chosen to reflect the symbolic resonance of the moment: Sen. Barbara A Mikulski of Maryland, the longest-serving woman in congressional history, and Rep. John Lewis of Georgia, one of the icons of the civil rights movement. Having been formally installed as the head of her party, Clinton&apos;s next task is to further unite the historically fractious party in the next hundred days so she might not only be elected the first woman president, but also lead the party to its third consecutive presidential victory for the first time since the era of Franklin D. Roosevelt and Harry Truman. More than four hours later, after an anecdote-filled stem winder from her husband, and with the delegates waving red and blue placards proclaiming "History, " Clinton appeared by live video hookup to thank the convention. "I can&apos;t believe we just put the biggest crack in that glass ceiling yet," she declared.